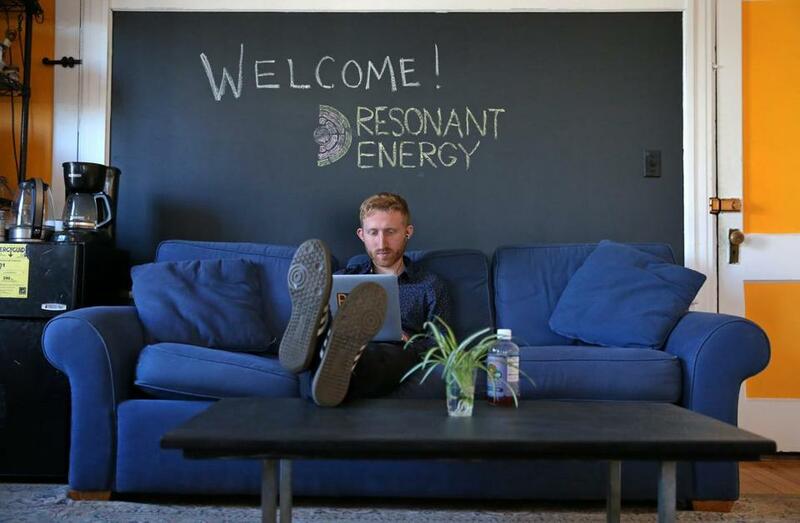 Resonant Energy co-founder Isaac Baker works seated on a couch in the company’s office in the 2nd Church of Dorchester. Resonant Energy’s office, located in the upstairs corner of an annex attached to the Second Church of Dorchester, is inconspicuous. There’s no sign informing passersby of the energy startup’s presence. The office itself is a modest two rooms appointed with scavenged furniture, much of which members of the now nine-strong team took pains to rehabilitate. But the handiwork of co-founders Isaac Baker and Ben Underwood is readily apparent on the southern face of the church’s roof, where solar panels bask in the sun. Resonant’s clients are nonprofits and people from middle- and low-income communities looking for affordable solar power. The startup has found a few ways to accommodate those sorts of clients. In some cases, Resonant leases a customer’s roof and hires a contractor to install a solar array, selling the energy it generates back to the host at a discounted rate. The company also sells solar energy to customers directly. 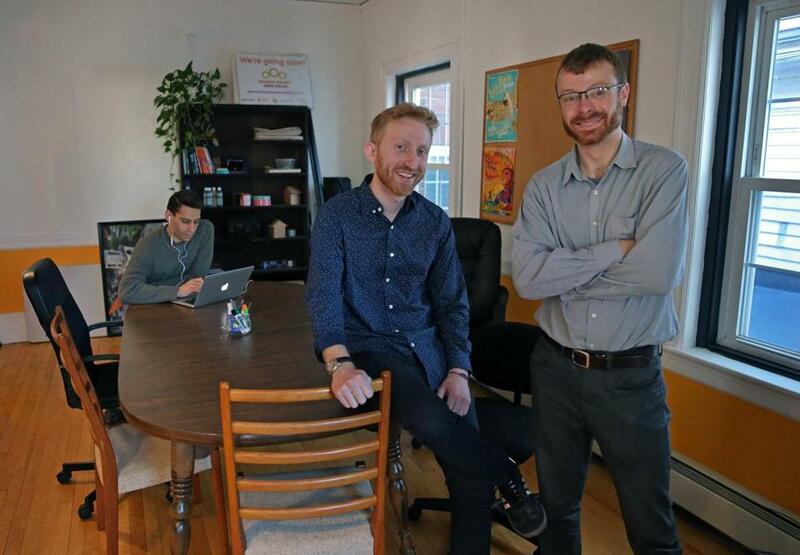 \Resonant Energy founders Isaac Baker (left) and Ben Underwood (right) at their office in a wing of the 2nd Church of Dorchester. Baker and Underwood say they consider themselves social entrepreneurs who have more in common with churches and nonprofits than they do with other startups. A stint at the WeWork near South Station drove that point home. Their current office is a better fit, they say. For one thing, they have a connection to the Second Church which ties in with Resonant’s creation. Baker and Underwood stumbled on their business model while at Co-op Power, an energy cooperative Baker’s mother founded. They were working on a project to equip several churches with solar panels at a price the churches could afford. The project was inspired in large part by a member of the Second Church who had known Baker and his mother for years. The work was grueling, and the project almost fell apart several times. But the process helped Baker and Underwood realize there was an interest in solar power among nonprofits and underserved communities that was going unaddressed. In August 2016, the two split off to found Resonant Energy, but continued to collaborate with Co-op Power to finish the church initiative. Three churches involved in the project now have solar arrays. Resonant has relationships with other community institutions, including the Codman Square Neighborhood Development Corporation, whose mission includes the development of sustainable housing and commercial spaces. Another partner, the Epiphany School, is also located in Dorchester. 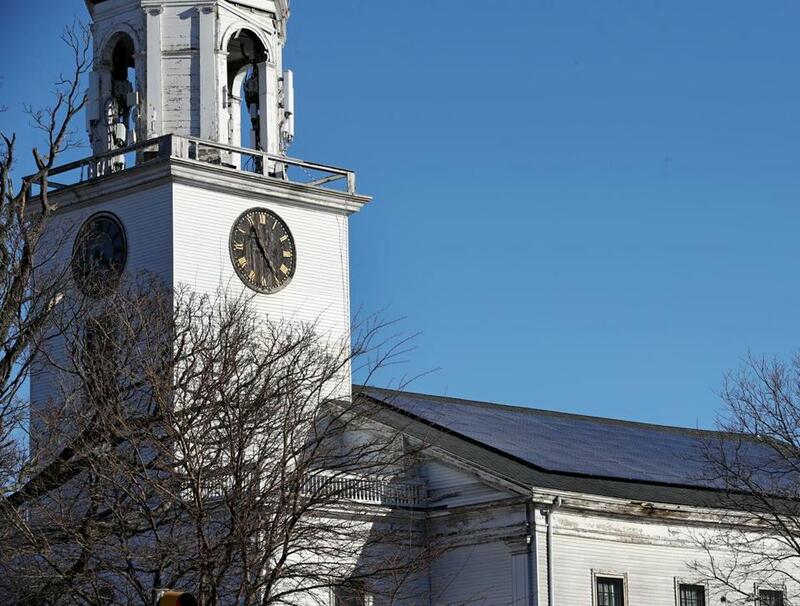 Resonant Energy installed solar panels on the 2nd Church of Dorchester where their office is located. Baker and Underwood say they regularly meet with those and related institutions — as well as community members — to discuss the role those entities want renewable energy to play in their communities. “The only way we can do our work is by being fundamentally accountable to groups who have been in the communities much longer than we have,” Underwood says. Both men say that working under the same roof as one of their earliest community partners helps them remain accountable. But the move to the church didn’t come without complications. For one thing, the office badly needed a makeover. The paint job — off white- and aquamarine-colored walls with brown moldings — left something to be desired. And a blackboard had all but disintegrated. Now the walls are a warm orange yellow, the blackboard is fixed, and the space is brimming with furniture and decor endowed with some history. Much of it was donated by friends and family who were among the startup’s first investors. “When we look around at the office . . . I see all the individual people who . . . gave us the couch, who gave us our coffee maker,” Baker says. The company scooped up a dozen chairs that were being given away by Harvard University, but the teal upholstery clashed with the office’s paint job, so Resonant’s senior project manager Alec Henry reupholstered them, with a little help, to a muted gray. Baker even brought his dining room table to the office. Before setting up shop in WeWork, he and Underwood spent 14-hour days in his apartment, hunched over the very same table. The team does most of their work on laptops, typing away at desks pushed up against the walls in one of the office’s two rooms. The other is primarily used for meetings. 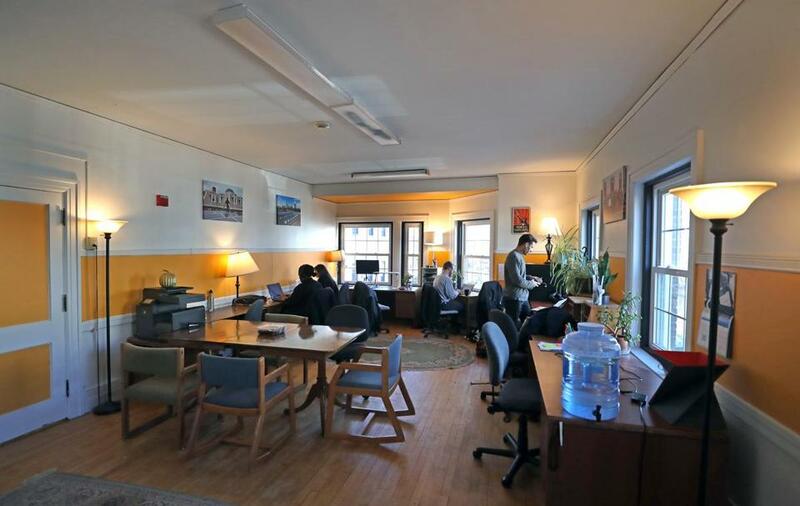 Resonant Energy’s office, located in a wing of the 2nd Church of Dorchester. Max Reyes can be reached at max.reyes@globe.com. Follow him on Twitter @MaxJReyes.